This article needs basic knowledge of SSRS and how to create report using SSRS because, we are going to learn something new to send or create report automatically and send it to recipient via email with relevant data, or what is called a Data Driven Subscription. You can create normal subscription in every version of SSRS but the data driven subscription is part of the Enterprise edition. Let go step by step to create Subscription. You will be in the SSRS web site from where you can run reports, create new reports, load Report builder, create subscription etc. 2. 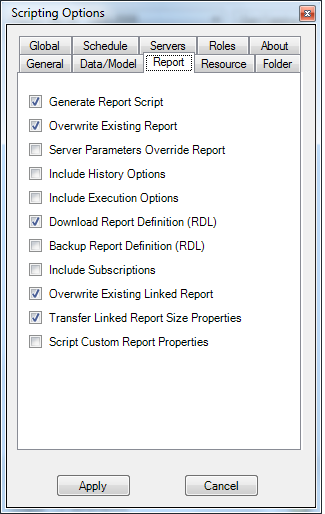 We will move to the Report folder from where report is located and open report property by right clicking on that. 3. In the below screen, you can see the report properties like Snapshot, Cache, Subscription etc. All these three features are important to the advanced user. We are not moving to that but giving you some brief introduction of those. 3.1. Snapshot is the feature to generate reports from that report image. 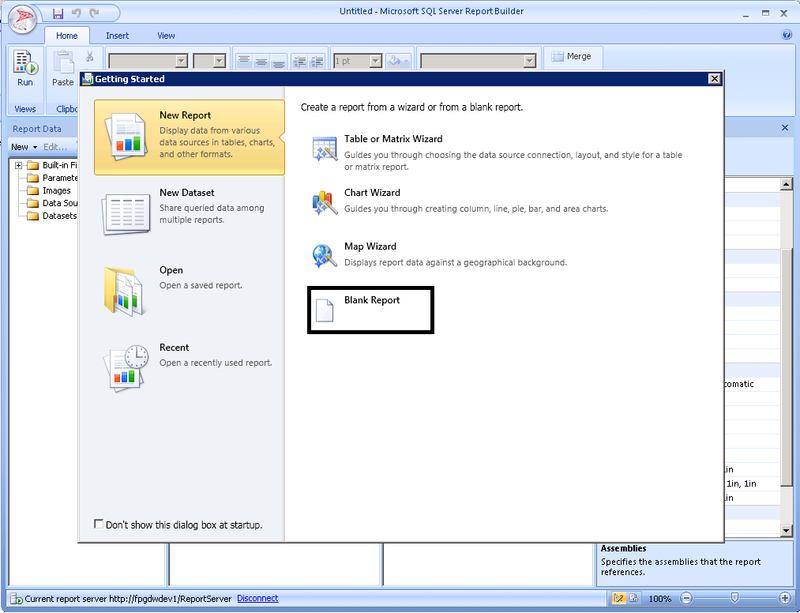 Snapshot means "make an image of the report and store in database". It is very useful for those reports in which data is not frequently changed. By this feature you can render the report faster. 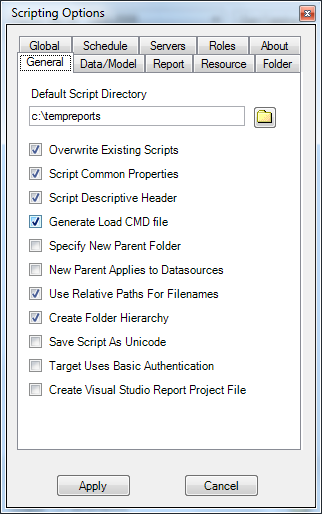 To get the feature up you have to select the option "Render report from snapshot" in Processing options. Is it possible to embed the report inside the email using data driven subscription? Congratulations !! It was a pretty close contest, but yours emerged as the eventual winner. Recently, I got a challenging work project. The client want to create reports on their own and have users all able to create report as well. We have been using SSRS report but the challenge is how? We have heard about ad-hoc reporting using SSRS but there is not proper information on web to sort out the issue. 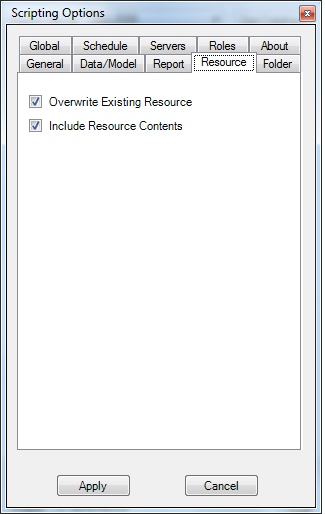 So, having worked on this, I thought I would provide some information on how to create a SSRS ad-hoc report, where users have the capability to create reports on their own, they just need knowledge of how to create report and report structure: i.e. what columns and rows he/she need and what details need to be summarized. 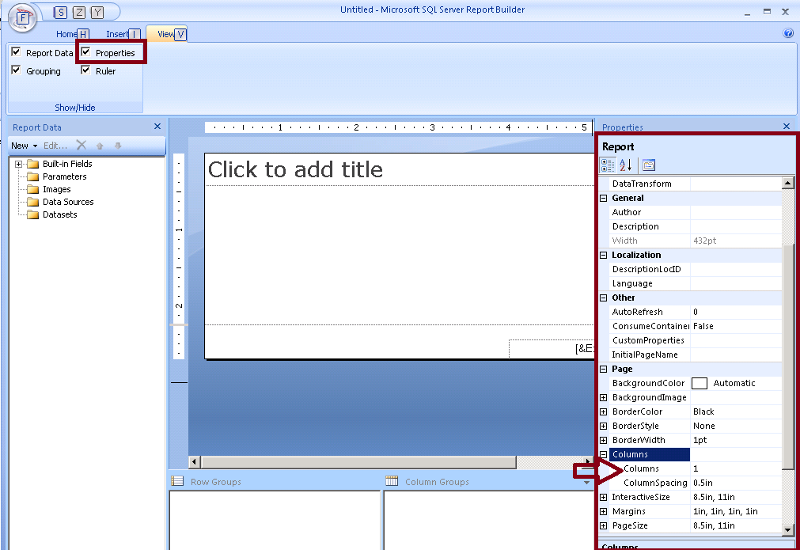 Let's walk through creating an ad-hoc report using SSRS Report Builder+ SSAS. 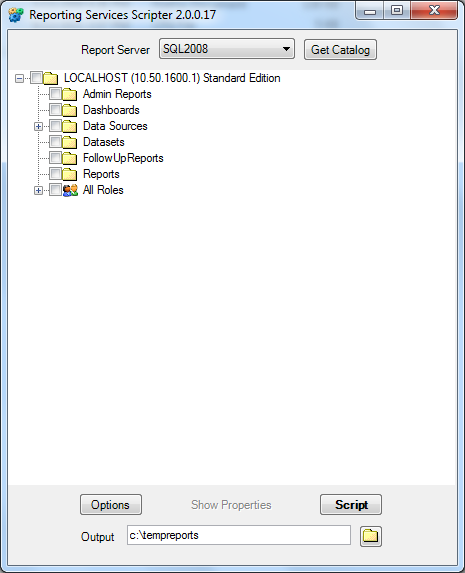 First open a report manager in IE 8 or with compatible mode in IE 9 as administrator. Now time to create report. 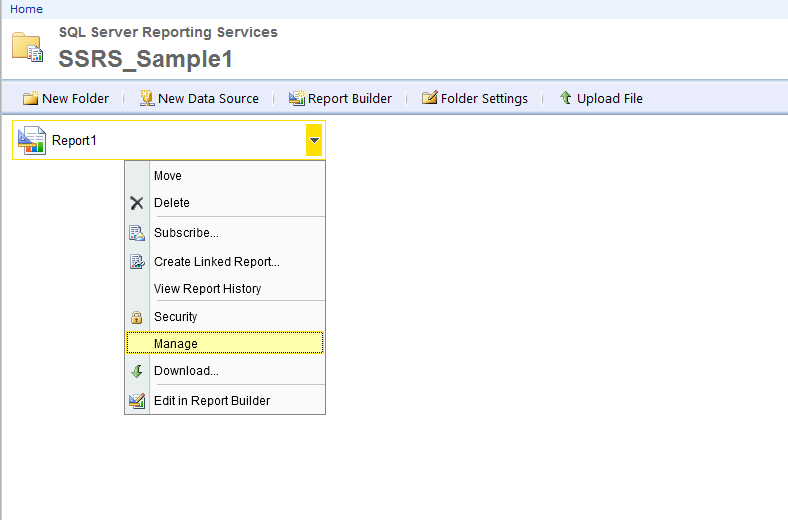 Hence, click on the image/ link of report builder to create report and follow the friendly steps to create. 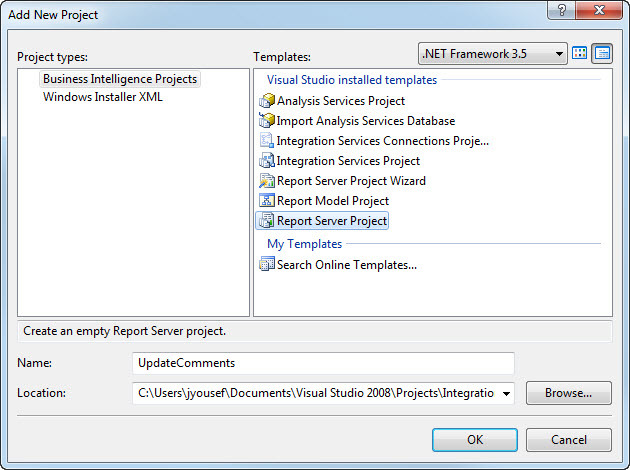 Create new data source for report from the published data source from report server. I have no issue. It's good to give something better to other. It's look fine. Thanks for you kind help. 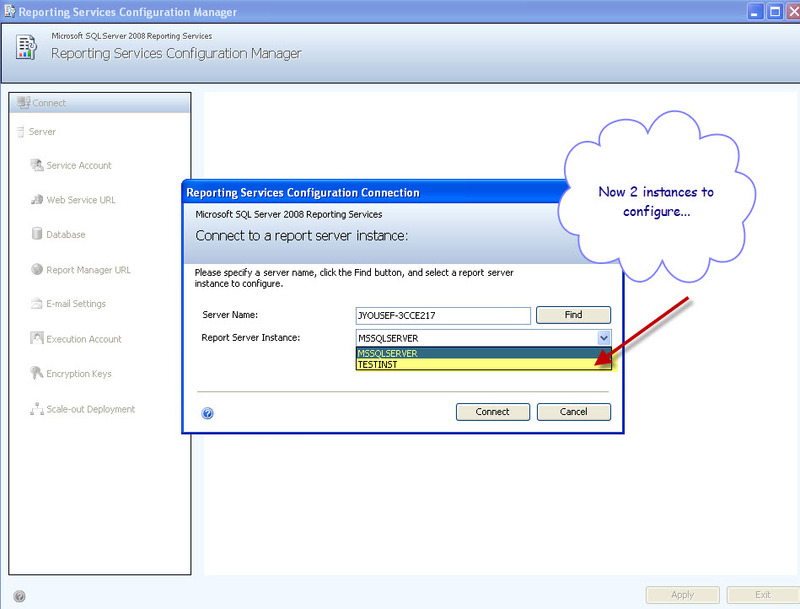 Add SSRS as a named instance. 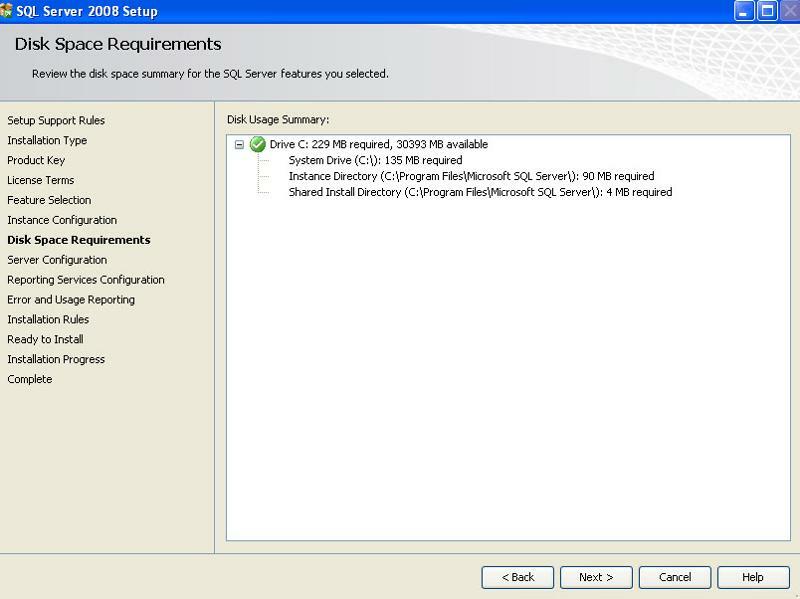 A recent questions about how to add SSRS named instances, couldn't find any that talks about SQL server 2008, anyway I decided to help by creating some screen shots. 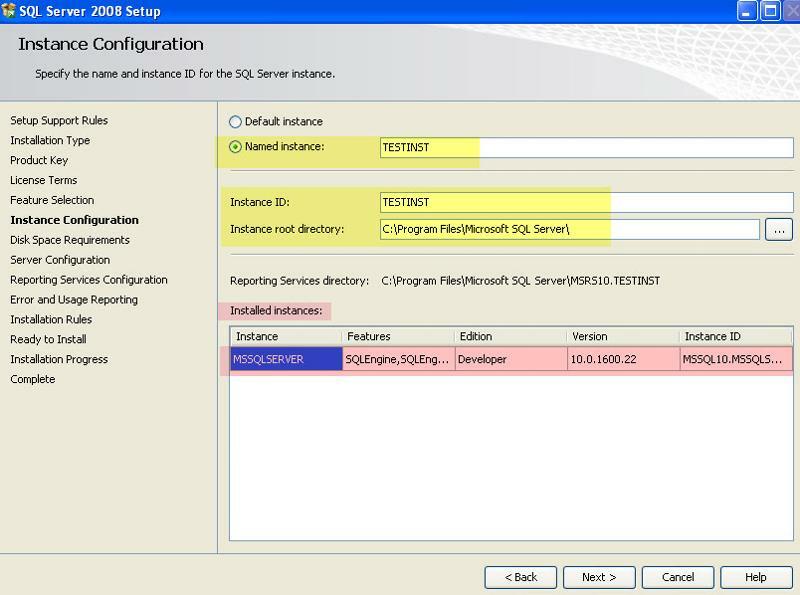 The installation is straightforward, you just pop the SQL server 2008 installation DVD , run the installer, select Reporting services from the "Feature Selections", then select "Named Instance", configure and you're done ! Select New or add a feature…..
1-SQL server 2008 will do additional tests and install installation support files. 2-Select perform a new installation of SQL Server 2008. 3-Only Select Reporting Services as that's what we need to install ... and press next. 4-Select named instance or you'll get an error ! 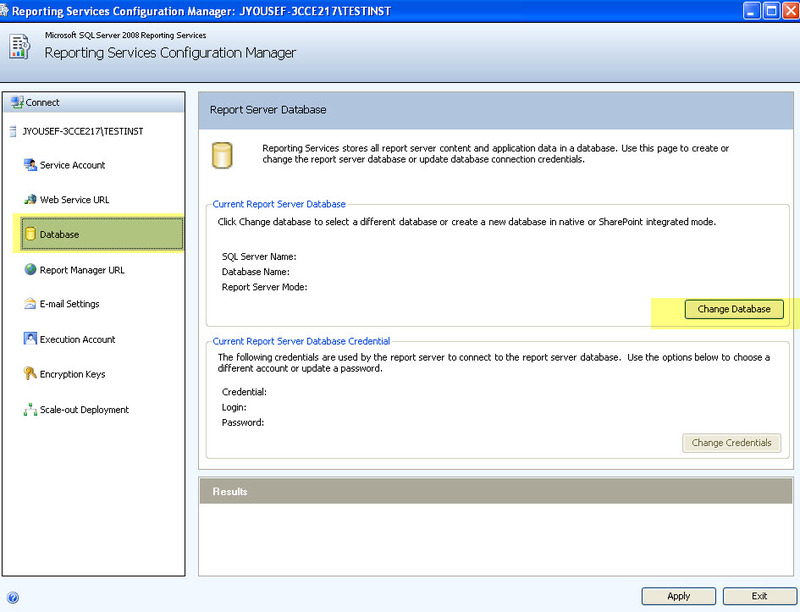 As SSRS has been installed already for the default instance. 5-Confirmation...and required space vs available space. 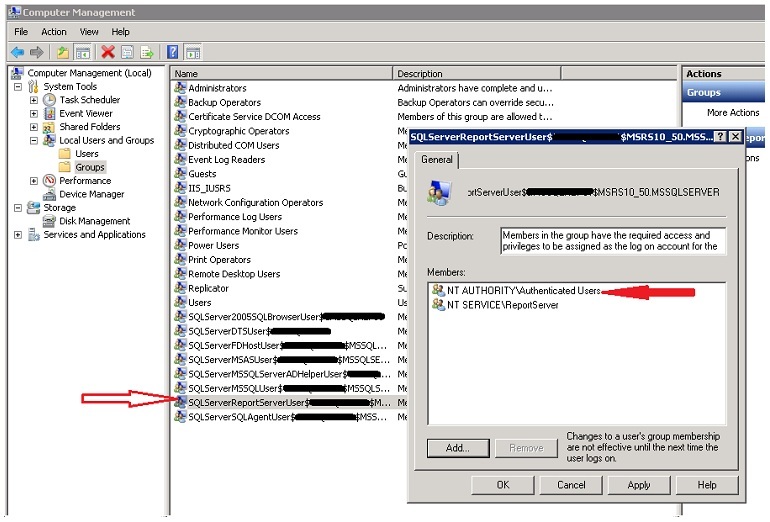 6-Select the service account for this instance's SSRS. 7-Installation. 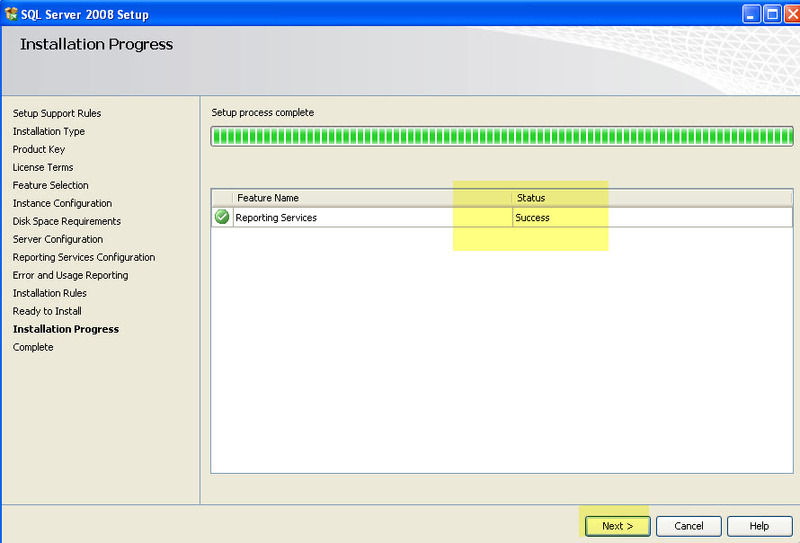 SQL server will take around 4 to 8 minutes depending on your machine..& will get you to the completion screen. 8-Now since the installation is done, let's configure the instance. 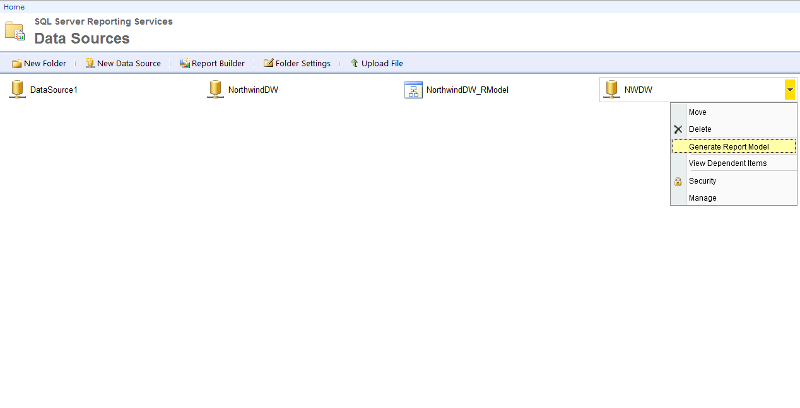 9-Hop to the database tab to install or point to an existing DB. In my scenario I'll create a new DB. Web Links Don't Show in SSRS 3.0 Subscribed Reports? It is helpful to note: This is a cosmetic update and is not required, but should help your reports look better for your boss. 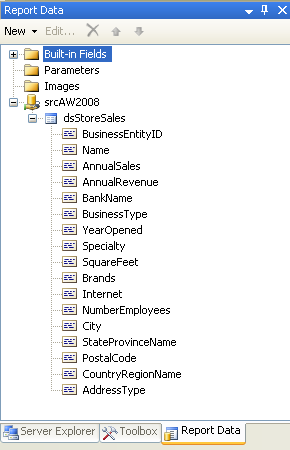 This issue has manifested itself in SSRS version 3.0 is where I have seen this behavior in. And this behavior is only seen in e-mail that has been received in Outlook. When subscribing to SSRS Reports, and when the e-mails are received, it is entirely possible that you don't or can't see the web links when provided in the results. Note: The links do indeed work, but cosmetically, they don't appear like a web link in the report. This adds in the Bold Style if there to test the existence of the Ticket_ID in SSRS. If the Ticket_ID does not exist, it would be blank (or null). This adds in the Blue Color if there to test the existence of the Ticket_ID in SSRS. If the Ticket_ID does not exist, it would be blank (or null). Thanks for the vote Jim! The LargePhoto field stores the actual image, not a url, in a varbinary(max) field. The first step of creating a SQL Server Reporting Services (SSRS) report involves setting up a connection to the data source and programming a dataset to retrieve data from that data source. The dataset can use a SELECT query, which is the most common way of retrieving data and one that you're probably already familiar with. But it can also use a Stored Procedure (aka stored proc or SP). I'll be using the AdventureWorks2008 sample database available for download at CodePlex. 2. 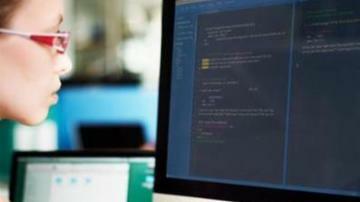 What Are Stored Procedures? A saved collection of Transact-SQL statements that can take and return user-supplied parameters. Regarding the 1st advantage of stored procedures: this is often-heard argument, however not valid since SQL Server 7. Since then, SQL Server is caching execution plans of all queries equally, s.p. or not. See article Inside SQL Server: SQL Server 7.0 Plan Caching, and this article where the author actually benchmarked it. About the only advantage in performance is sending less bytes to the server, i.e. sending execute mysp instead of (potentially long) query. 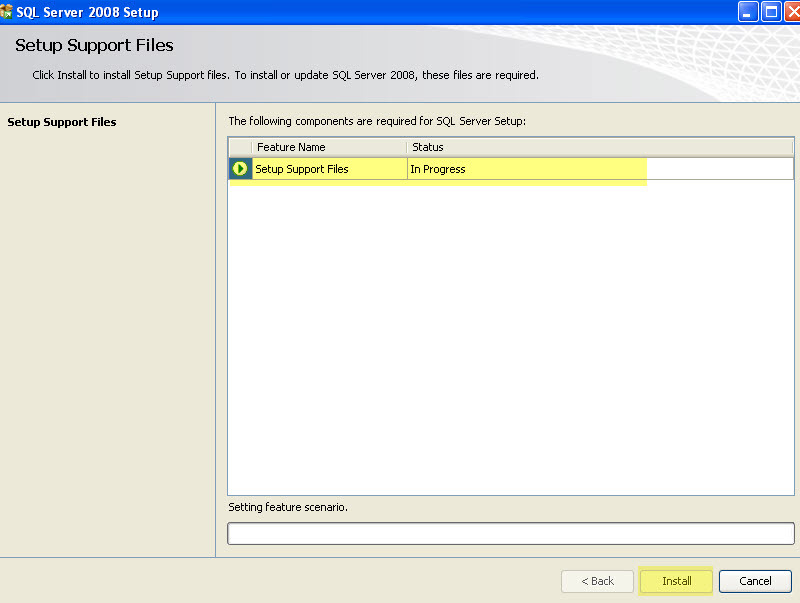 can you do the same for SSRS 2010? I have heard from my friends that it’s not possible to create Label Printing report using SSRS. I am amazed after hearing this words not possible in SSRS. I googled lot and found that it is possible to some of people know about the Report Builder. Because, all are used to with BIDS to creates report. When you open the Report builder it will ask to Report Templates (Tablix, Blank etc.) as like crystal report. 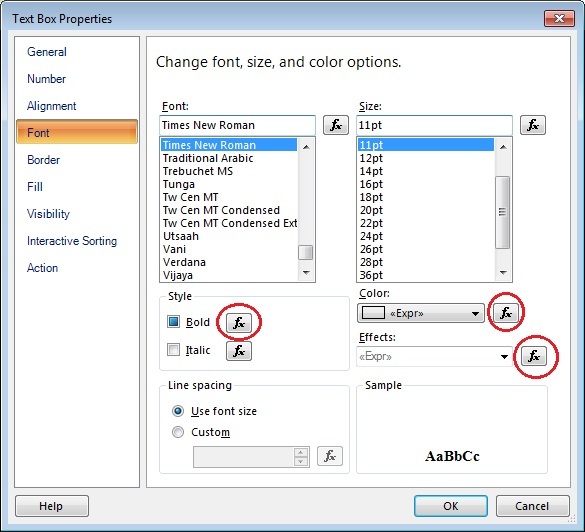 From the list select the Blank template and start to work as normal BIDS environment. First set the Report Layout and size of the report. It’s good to set all report properties (different margins) to print report appropriate on paper. 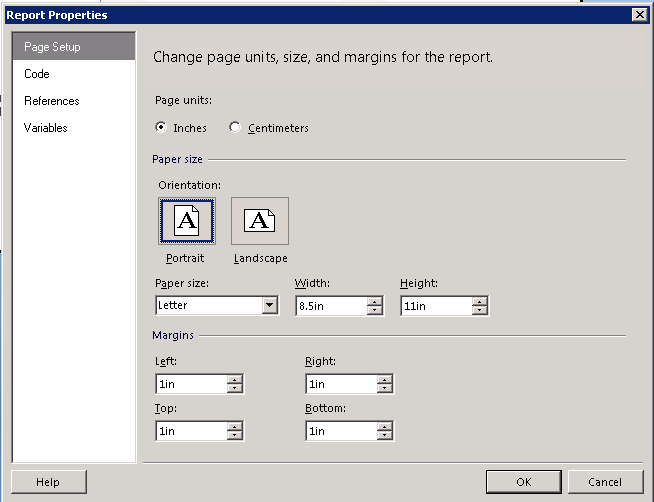 After setting margins for report set the columns for the Label printing report. It’s obvious thing for label printing to set columns per page. i.e If you want to print 3 label on single row then set 3 columns. see image below to set the columns. when i run project only column 1 has data and 2 other columns is empty! 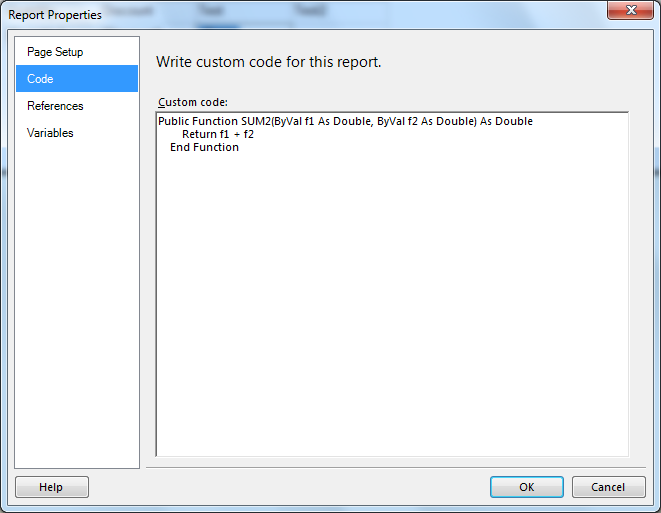 How to use Variables and Custom code in SSRS report and Assembly reference to use compile shared code in SSRS. Its big question for all who are working with SSRS. It is easy to create assembly and refer in SSRS report, still there are some steps need to be applied. Let's look in details. 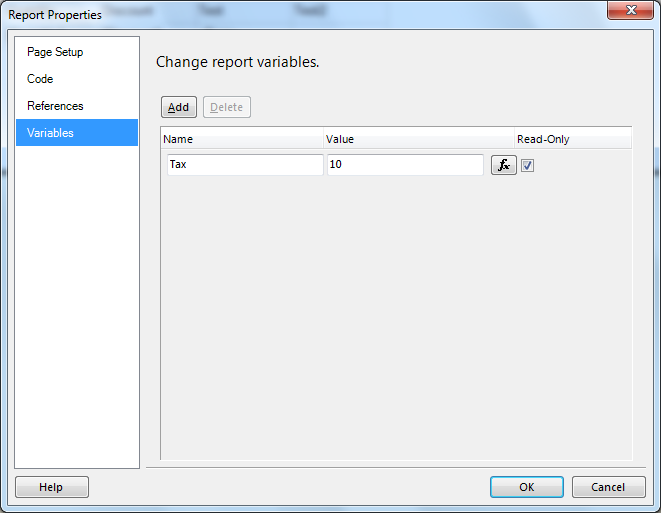 If you want to use or hold value through out the request then refer the SSRS variables. 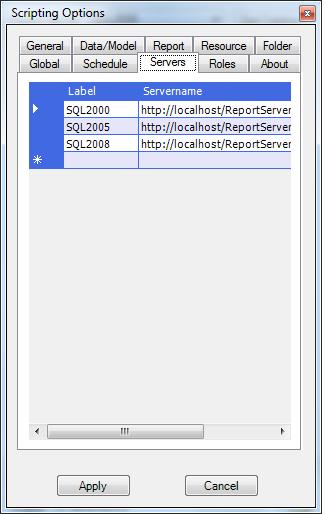 It is available in any part of report and lifetime of variable is request to server. It reset when new request comes to server. 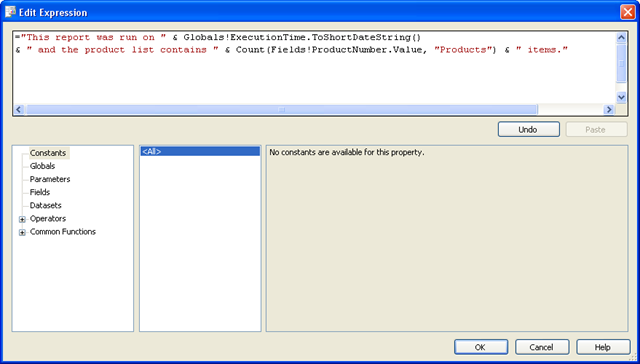 Custom Code is very useful where you can not achieve desire result using Sum/Avg/Count/Running Total. For example in report you are displaying records (Products) those have price > $10 That time you can hide those rows in report but total not eliminate hidden rows in count. In these type of case it's good to have custom code. Let's see how can we create custom code. Note: Make sure SSRS support custom code in VB only. Let's time to see how to use the custom code in report fields. This code started out as a fix for a customer that had incoming data that was hunderds of numbers and words long that was to fit in one column. The problem was that the customer did not want to split words or numbers when wrapping in the column. Ok the fun part was "how am I going to control the output to the column from the table? ". So the first thing I started working on was seeing how many characters would fit on a single line of the column that I need to use; and still look nice in the report. Since the report had alot of data per detail row in the table I ended up with a column width length of 29 characters for this report. What was nice was that on this report the data was being split up by using a comma as a delimiter. Once the width was decided, the next step would be to wrap the incoming data so that each part of the data would wrap by design rather than arbitrary. My favorite namespace in coding this type of data is using RegularExpressions; the use of RegularExpressions is only limited to your imagination. The code could be used with other applications. You would just have to experiment with it in the project that you are working on. Have you ever had to extract data from a Microsoft SQL Server database and export it to an Excel file, but did not want to use a DTS package? 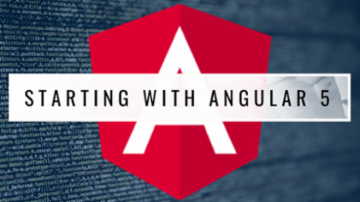 The concept in this article is not new, but it is the answer and will also work on 64-bit SQL boxes. 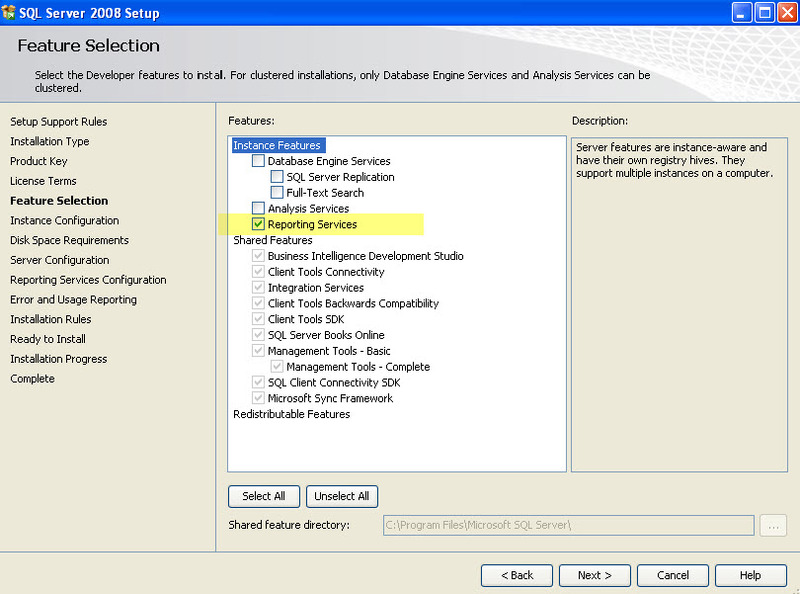 Cannot get the column information from OLE DB provider "Microsoft.Jet.OLEDB.4.0" for linked server "(null)". So, I downloaded and installed on my SQL Server the Office 2007 Drivers and used that instead of JET. The Office System Drivers proved to be perfect to transfer data between the supported file formats and SQL Server! 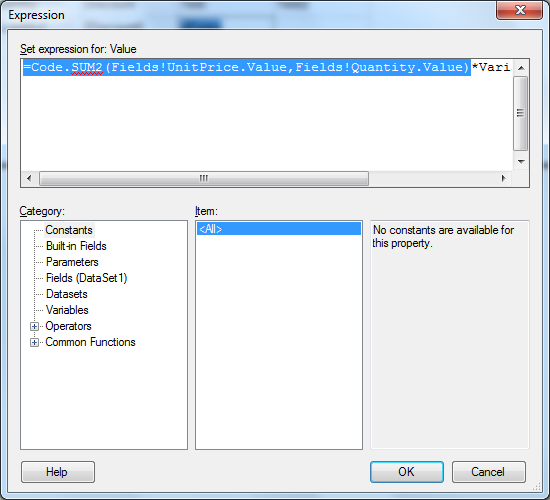 First you need to create an Excel template that has the structure of the data you want to export. For example, I have created an Excel file with two columns: Name and Date. On my system, I have saved this file as D:\ETLsFiles\Excel\template.xls, which I will refer to below. Note for 64-bit SQL Server that since the ACE drive is 32-bit, that you will often get a similar error message to what you got for JET. If you worked around this, it would be interesting to learn how. As far as I know though, it will work fine for 32-bit SQL running on 64-bit Windows. Anyway, thank you for sharing. You have my Yes vote above. Starting Entered Date (Date) formatted as Data type: "Date/Time"
Ending Entered Date (Date1) formatted as Data type: "Date/Time"
TimeZone formatted as Data type: "Text"
Note: It depends on where your data warehouse is located..
We are going to be changing the following.. If we look up this ticket we see that the time is not correct (off by two hours). The Entered Date is not correct! 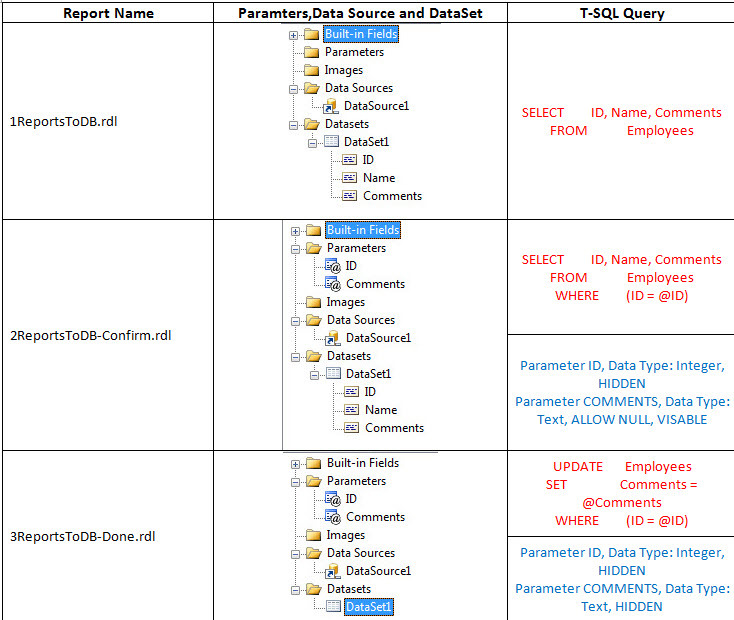 As you'll probably know, a data region in a SQL Server Reporting Services report can be linked to only one dataset. This makes it troublesome when you need to display data from more than one dataset in the same data region. 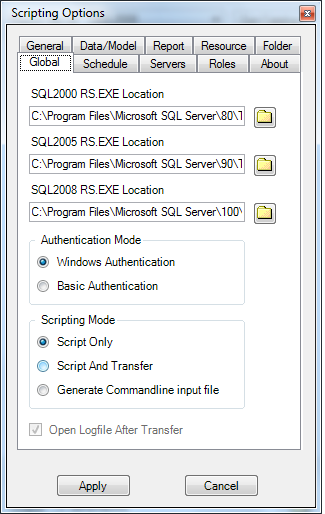 SQL Server 2008 R2 has got some interesting new functionality to facilitate data retrieval from other datasets. 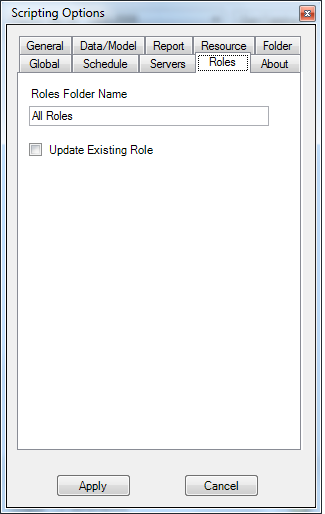 In this article I will show you how exactly this works by using the new Lookup, LookupSet and MultiLookup SSRS functions. I'm using the AdventureWorks 2008R2 relational database and the AdventureWorksDW 2008R2 data warehouse, available from CodePlex. The main data is coming from the data warehouse while all the lookups are done on the relational database. Using that dataset, I've set up a Table as shown in following screenshot. In a report I've more Shared DataSources. Call them as DB1, DB2 and DB3. Each datasource points to different databases from different servers. But the tables and their schemas are common to them. This is applicable for SPs/UDFs as well . 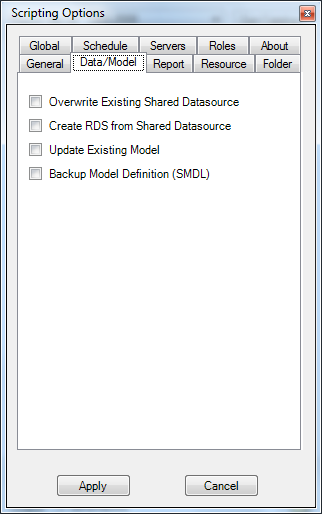 Is there any way to fetch records from all of the above Datasources from a RDL and show in report? I know this is not the right place to ask the question. As your artilce is related to that I ask here. I would like to get solution for my problem. Please do suggest. Thanks in advance. EaswaranP: as far as I can tell you were already given an answer to that question here: Is it possible to fetch records from more than on DB for a SSIS report? I should be able to delete my own idiotic comments... I found it. But it makes no difference my users still get asked for administrator password. After much searching across the internet I have found that you could not set the name of the file you were attaching to dynamic report subscriptons in Microsoft Reporting Services. I did manage to find one article showing you how your could make a stored procedure to actually execute the report from, providing the parameters. However this only worked for one parameter, and was kind of a pain for a long term solution. I found the core of this method was using the path in the catalog table. 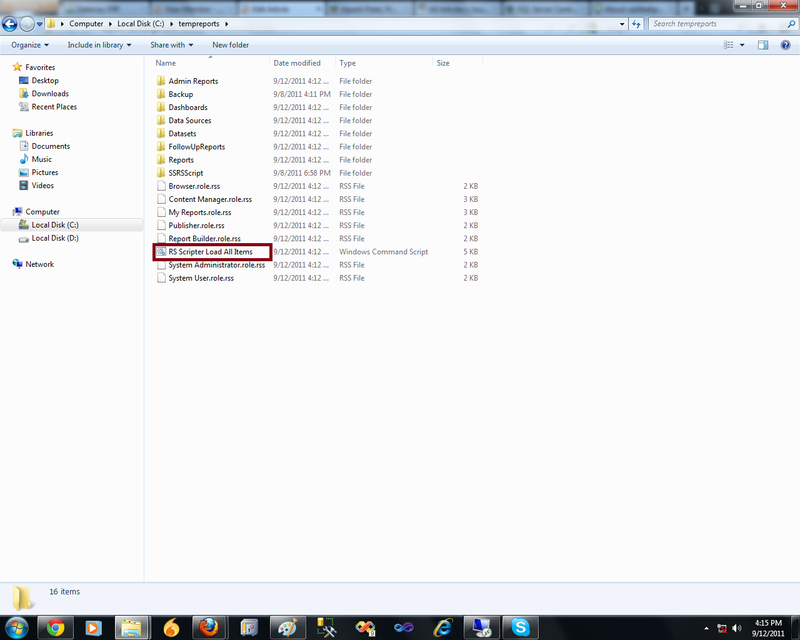 That is what the file name is based off of. So I have created the stored procedure below to be run every 15 minutes (you can change the timing) the change the path of the reports that were going to be generated in the next 15 minutes and to change back the path of any reports that were previously generated. The only limitation of this is that you cannot access that report directly in the report server during that 15 minutes. 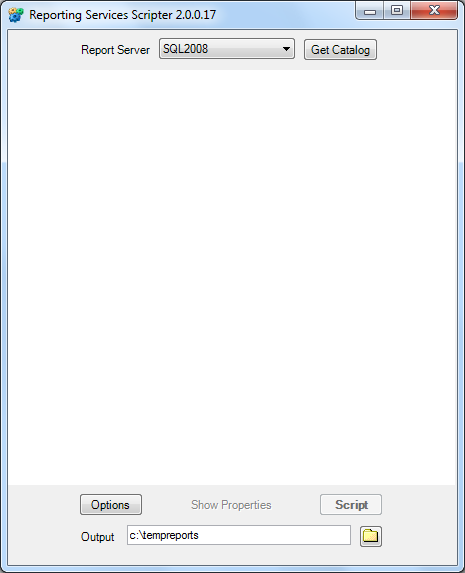 Howver, you can alter the script to change this timeframe if you would like to limit that window. This has only been tested on Data-driven subscriptions on shared report schedules. This may not work in other scenarios as the date fields I use are specific to shared report schedules. This article is aimed at report developers who are used to developing reports using relational databases and have gotten a first-time assignment to develop reports on OLAP cubes. The OLAP database used in the article is called "Adventure Works DW 2008", available for download at CodePlex. If you're fairly new to Reporting Services (aka SSRS) and you find that this article is going a bit too fast, I'd like to point you to my other article which explains how to build a report that's retrieving data using regular stored procedures. When people are talking about databases, what they are usually referring to are "regular" relational OLTP databases. OLTP stands for Online Transaction Processing. As the name implies, these types of databases are built to handle many simultaneous transactions (consisting of actions such as inserts, updates, deletes) in real-time. I'm sure you're familiar with these types of database so I won't go further into them. BTW: please don't forget to click the Yes button next to "Was this article helpful? ", as apparently you found it helpful. In this short article I will be talking about two functions in the SQL Server Reporting Services (SSRS) function stack. 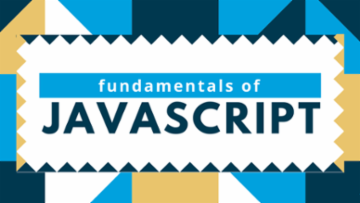 Those functions are IIF() and Switch(). And I'll be showing you how easy it is to add an Else part to the Switch function. 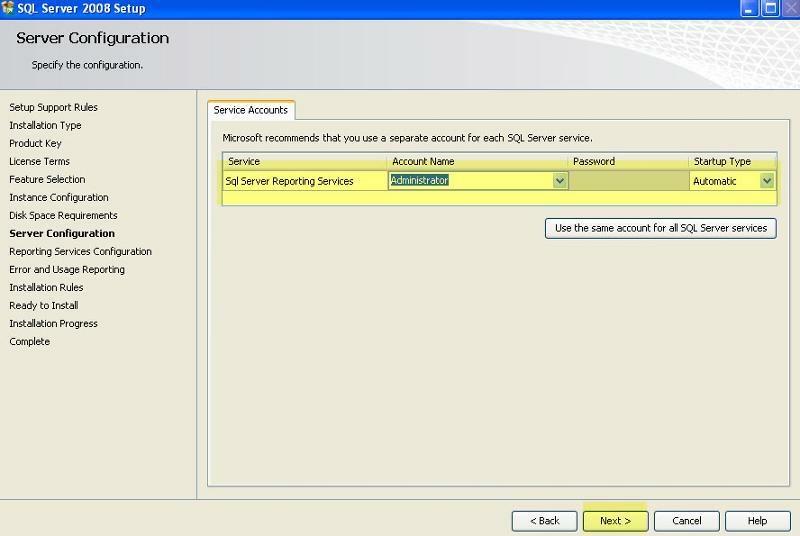 Two commonly-used functions in SQL Server Reporting Services are the IIF() and the Switch(). These are two functions of the Program Flow type, or Decision Functions as they are called on this MSDN page. In case you're wondering why it's so difficult to find a function reference for the built-in functions of SSRS, it's because these are actually Visual Basic functions and Microsoft refers to those for any detailed explanation. Their references are located at the bottom of this article. Anyone who's done some programming most likely already knows the if <expression> then <some_code> else <other_code> statement. If <expression> evaluates to true then <some_code> gets executed, else <other_code> gets executed. Returns one of two objects, depending on the evaluation of an expression. 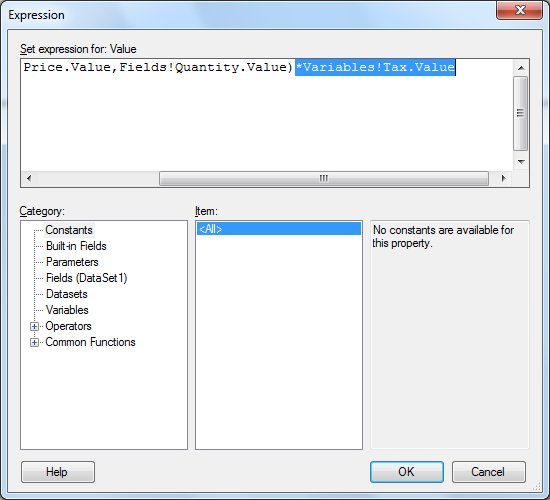 In a previous article I announced that I would write a sequel covering how to pass multiple-value parameters from a SQL Server Reporting Services report to a stored procedure. So that's what I will be writing about in this article. 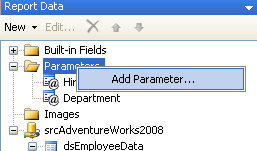 As we've already seen in Part 1, parameters can be passed from a Reporting Services report to a stored procedure. The parameter that was used was just a simple, single-valued parameter. 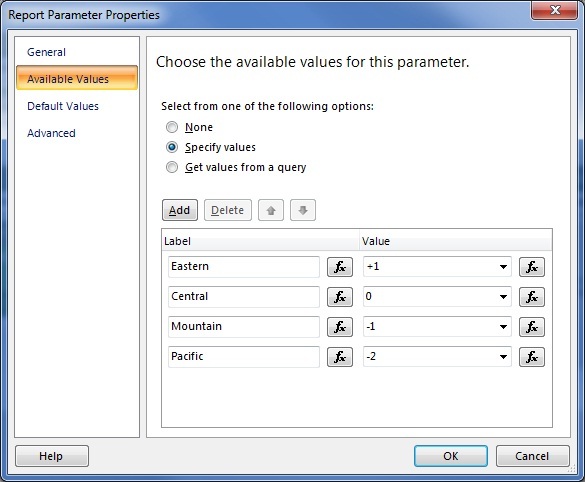 However, a report parameter can be defined as being multi-value. Let's set one up! Our report currently shows a list of employees who were hired after the selected hire date. One of the columns being shown is the department in which they're active. We will modify the report so that it's possible to filter the data on department - only the selected departments are to be retrieved from the database. Great article and easy to follow. Is there anyway the 'select all' functionality can be added into the stored procedure? Conversion failed when converting the varchar value '-1,1' to data type int. A while ago I wrote an article called Chart Optimization Tips. 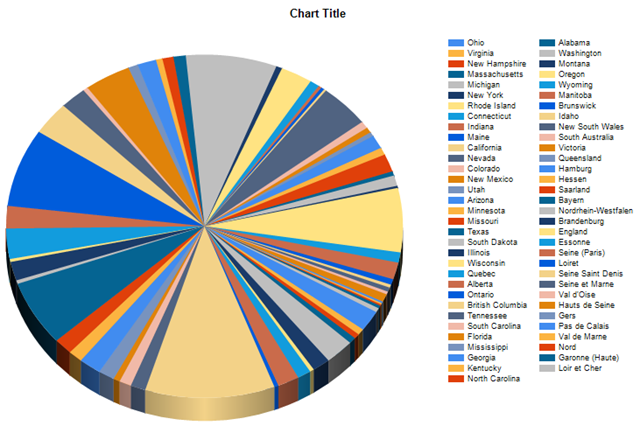 This article explained how to optimize a Column Chart. Today I have returned to show you some Pie Chart implementation techniques. As usual, I will be using the AdventureWorks2008 database, available at CodePlex. 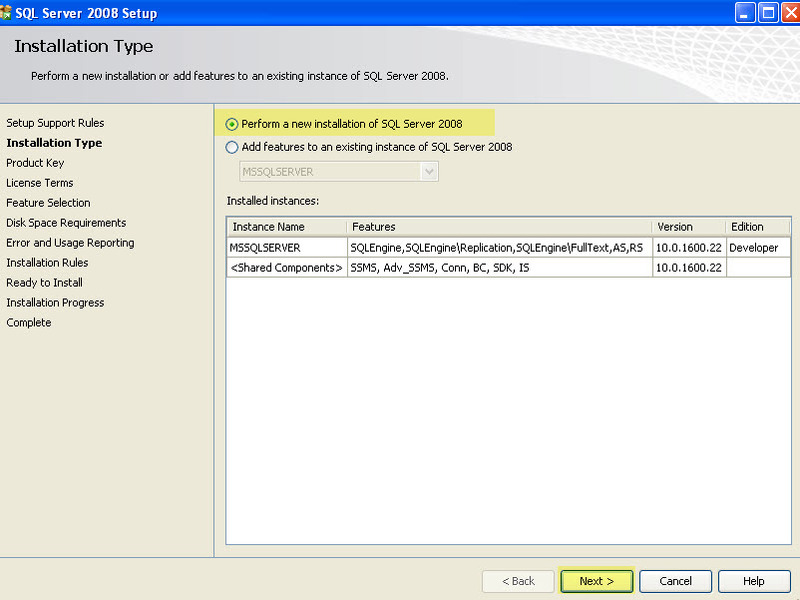 The chart itself will be implemented using SQL Server 2008 Reporting Services. This query illustrates a bad coding practice: never use "SELECT *". Ideally you should only retrieve the columns that you need for the report. That will optimize performance when generating the report. But that is not the goal of this article so I'll leave the query as it is. 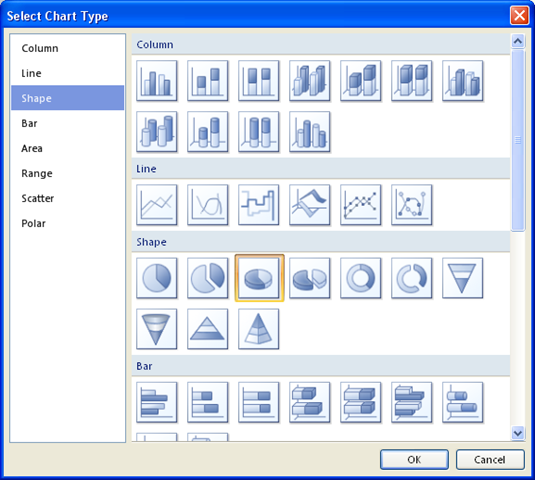 To get started with our Pie Chart I have selected the third icon in the list of Shape charts. This adds a regular 3D pie chart to the report. To set up the chart I dragged AnnualSales from the Report Data pane into the "Drop data fields here" area and StateProvinceName into the "Drop category fields here". In case you don't see the Report Data view (it has a tendency to disappear now and then), you can open it through the main menu: View > Report Data. Except that some clients will get dinner somewhere else if you tell them that. For those, it's nice to know about the technicalities of baking a pie. Yeah, I know. Sadly. But if we all stick together and show them how much more value they can get from a chart that suits the situation, they may see the light in the end. For the following example I'll be using SQL Server Reporting Services 2008 and the Adventure Works cube running on SQL Server Analysis Services 2008. In case you don't have the AdventureWorks databases and cubes yet, they're available at CodePlex. I could have called the article "How to implement conditional formatting using SQL Server Reporting Services 2008", but I didn't. Because that's not the only thing what this article is trying to illustrate. The initial purpose of this article is to show you how you can detect missing fields when retrieving data from an OLAP cube. On top of that, the article also shows how thresholds can be used to highlight values in a table.